Detailed instructions can be found in TracRepositoryAdmin in the trac wiki. sudo -u www-data trac-admin /var/trac/projects/play repository resync "play"
Edit trac.ini to configure the updater. /usr/bin/trac-admin /var/trac/projects/play changeset added "$1" "$2"
/usr/bin/trac-admin /var/trac/projects/play changeset modified "$1" "$2"
Enable the CommitTicketUpdater plugin by going to the admin tab in trac and then selecting Plugins from the Administration Panel, open the Trac 0.12.5 plugin and tick CommitTicketUpdater as shown. Having completed all of the above configuration I rebooted my RPi, I don’t know that this is required but it seemed sensible. I like each trac project to be immediately identifiable so that it is obvious which trac I am working on. I just set the project logo. The logo looks best with an image of a little under 100 pixels high. I saved the files as play.png in /var/trac/projects/play/htdocs. 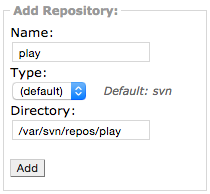 Using SVN pre-commit hook to ensure valid commit messages.